We've unearthed dinosaur skeletons and reconstructed them, but we've never laid our hands on a single dinosaur brain - until now. 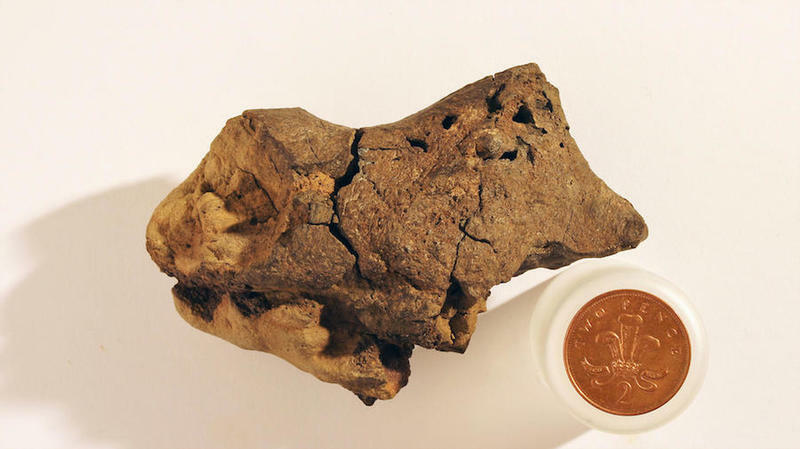 University of Cambridge researchers have now concluded that a rusty-brown rock found on a beach more than ten years ago is the fossilized brain tissue of a dinosaur called Iguanodon, a large herbivore that lived roughly 130 million years ago. Jamie Hiscocks, a fossil hunter and collector, found the 'brown rock' in 2004 near Bexhill, England. “He picked it up and noticed that its shape and texture was slightly unusual,” said Alex Liu of the University of Cambridge. The fossil was formed when the dinosaur’s skull cavity filled with sediment that hardened before the skull could break into separate pieces. Thus, the remaining solid object has revealed the shape of the inner skull cavity. Moreover, the researchers studying the fossil found what they think are collagen fibers and blood vessels. These form the protective outer covering that shields a brain. The outer millimeter or so of the fossil “is actually mineralization of some of the soft tissue structures that were preserved before they decayed away within the original dinosaur braincase,” Liu said. What this all means, if the above jargon confused you, is that this particular fossil is special because it likely contains the first actual pieces of a dinosaur brain ever unearthed. If Liu is right, of course, this is a discovery the likes of which the world has never seen before. Is This The Most Bizarre Coincidence Of All Time? Japan Fixes Fukuoka City Sinkhole – in Two Days!